For those who are not into full time blogging, let me ask you guys – How do you manage your work-life-blog equation? You have got work to do ($$s) , you have got family commitments to keep and of course, take care of your daily stuff as well. So when do you start blogging? In the morning? Or do you decide on post topics in the night and write/publish in the day time? As far as I am concerned, its a mix of all these strategies. Most of the time, I start working on my blog after 11 PM, finish till 12/1 in the night and post them in the day time. I do sneak into blog traffic statistics during the day time, and also catch up with my favorite blogs and feeds. 8 PM – Start Blogging!! 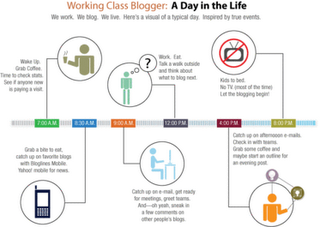 Sounds really true and I am sure most of bloggers follow a similar routine. What about you? Tell me how do YOU manage your work-life-blog balance?